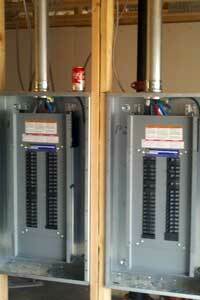 Delaney's Electric, Inc. provides many electrical services to commercial clients. We offer solutions for all your commercial electrical needs, as well as resources and information so you can make the best informed decision about your electrical needs. Electrical Solutions for commercial properties include Specialty Wiring, Breakers and Fuses, Lighting, Panels, Power, Surge Protection, Circuits, Outlets, Switches and Dimmers. Breakers and Fuses Services include electrical switch gears, magnetic circuit breakers, thermal magnetic circuit breakers, common trip circuit breakers, and AFCI arc fault circuit interrupters. Circuits and Circuit Interrupters such as GFCIs and AFCIs. Wiring including indoor or outdoor wiring for new construction, retrofits or remodels. Lighting including indoor and outdoor fixtures such as parking lot lighting. Outlets and Switches for inside or outside your building.